Their journey is relentlessly endangered by mythical demons and monsters - this time by demonic spider women and an evil alchemist. Jouney to the West: Monkey King at Spider Cave brings together American and Taiwanese artists to present one of ChinaÕs most beloved stories to audiences of all ages and ethnicities. Monkey King at Spider Cave is a stunning multidisciplinary work of shadow theatre using Larry Reed's hallmark shadow casting techniques, resulting in a enchanting evening of theatre that combines the power and scale of film with the immediacy of live performance. Monkey King at Spider Cave, inspired by an episode from Journey to the West, the beloved 16th Century Chinese epic, unfolds an adventure of a Buddhist High Priest and his animal disciples in their quest to bring the Buddhist scriptures to China. Their journey is relentlessly endangered by mythical demons and monsters - this time by demonic spider women and an evil alchemist. Journey to the West is a frequent subject of operas and cartoons throughout Asia. The most famous and beloved of characters from the epic is Sun Wu Kong, The Monkey King, popular for being cunning and acrobatic, but with a playful and childish attitude that hides great wisdom. An ambitious international undertaking, Monkey King at Spider Cave features 19 performers and musicians from Taipei and the San Francisco Bay Area, who create a fluid, movie-like effect by executing carefully choreographed sequences to original live and recorded music, and by manipulating scenic slides behind a 30ftx15ft rear projection screen. This Buddhist parable of good/evil and struggle/perseverance is told in Mandarin with English narration and is a rare blend of tradition and innovation that culminates in a remarkable work of shadow theatre. Monkey King at Spider Cave was developed in San Francisco and Taipei over 3-year period. 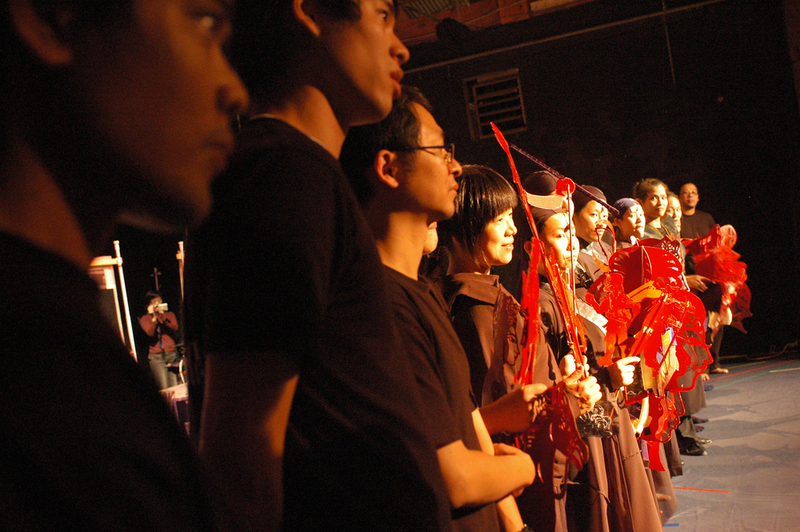 The production was premiered in San Francisco in October 2006, and was presented in a 2-month multi-city tour in Taiwan March - May 2007.